Prof. Tony Janovich began his Jujitsu study under Prof. Kufferath at the age of 12. Previously he had studied under his father, who had taught hand to hand combat in the Marine Corps. Janovich spent many hours in training, even practicing after class and on weekends with his teacher. In addition to his physical training, he was also amassing a great deal of knowledge about the life and deeds of Danzanryu founder Prof. Henry S. Okazaki from Kufferath. Under Prof. Kufferath he was guided and instructed through Danzan-Ryu Jujitsu including all the “Okugi” (advanced teachings) levels and is the only person awarded a “Kaidensho” with the title of Shihan and “Mokuroku” instructors scroll directly from Kufferath. In addition Janovich became a master of the Okazaki system of Restoration Therapy known as Seifukujutsu under the tutelage of Prof. Kufferath. In 1997, Janovich was awarded, 8th dan, the highest degree ever given by Kufferath, who had also awarded him the title of Professor back in 1989. 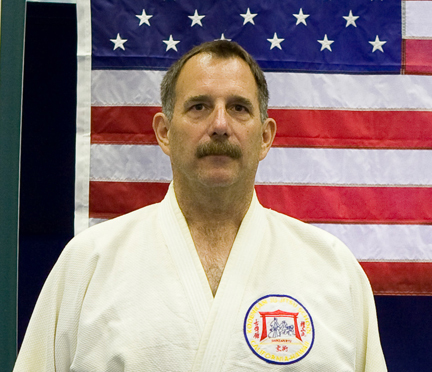 At the 2007 Ohana, Professor Janovich was elevated to Judan (10th degree black belt) by the Kodenkan Danzan-Ryu Jujitsu Association and the Kodenkan Jujitsu School Council of Black Belts. 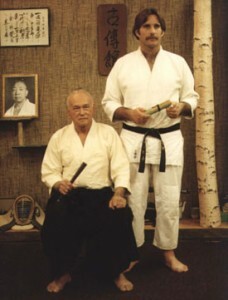 In the summer of 1993, both Professors Kufferath and Janovich held a special class called Kodenkan Jujitsu Okugi® for black belts from 2nd dan to 5th dan. This class was held at their dojo in Campbell, Ca. black belt instructors from across the United States came to be a part of this historic event. This class was keeping in tradition and based partly on the class held by Okazaki in 1948 that he called “special class”. In this class, the students were taught all of the advanced techniques from Danzanryu and were awarded a Kaidensho, or “full transmission certificate”. In doing this class, Professors Kufferath and Janovich continued a Danzanryu tradition begun some 45 years earlier. A law enforcement officer, he has taught for the Department of Defense, various police agencies and colleges. He has owned and operated the Kodenkan Jujitsu & Restoration Therapy for 41 years. Prof. Janovich was the most senior student and chief instructor of Prof. Kufferath prior to Kufferath’s death. Text and Graphics Copyright © 1998,1999, 2001, 2007, 2014, Kodenkan Jujitsu & Restoration TherapyAll Rights Reserved.